Photogrammetry is a technique for estimating the exact position of surface points of an object by using multiple photographs. Aerial photogrammetry is based on the acquisition of photographs of a certain area from the sky, commonly by placing cameras on a plane, drone, or even a satellite, to create a topographical map or terrain model. Terrestrial photogrammetry aims at taking 3D measurements of an object, using photographs of that object taken from a camera positioned on the surface of the earth. Terrestrial photogrammetry is also referred to as close-range photogrammetry when the photographs of the object are taken at a close range. Photogrammetry is a manual process which requires in-depth understanding since it involves several aspects; for instance, the focal length and position of the camera when taking each photograph will impact the quality of the end result. However, recent technological advancements (increase of computational power, release of affordable, yet powerful, digital cameras, etc. ), along with the availability of free, user-friendly software, have simplified the process of photogrammetry. Combined with high-quality companion software, digital close-range photogrammetry is heavily used for the 3D digitization of cultural heritage. The most widespread photogrammetry method for creating 3D models of real objects is based on structure-from-motion (SfM). SfM involves the provision of overlapping images of an object, captured from multiple viewpoints (see Fig. 1). Important data, such as the camera’s position and orientation, are automatically calculated by specialized software, which also facilitates the 3D model creation and texturing process, extracting information directly from the set of overlapping images (Westoby et al. 2012). The 3D digitization of cultural heritage is a common practice for the generation of 3D models used for exhibition, conservation, and protection, 3D printing-based replication, dissemination through web and mobile application channels, digital restoration of damaged parts, and monitoring of overtime alterations (e.g., when cultural assets are exposed to open environment) (Pieraccini et al. 2001). 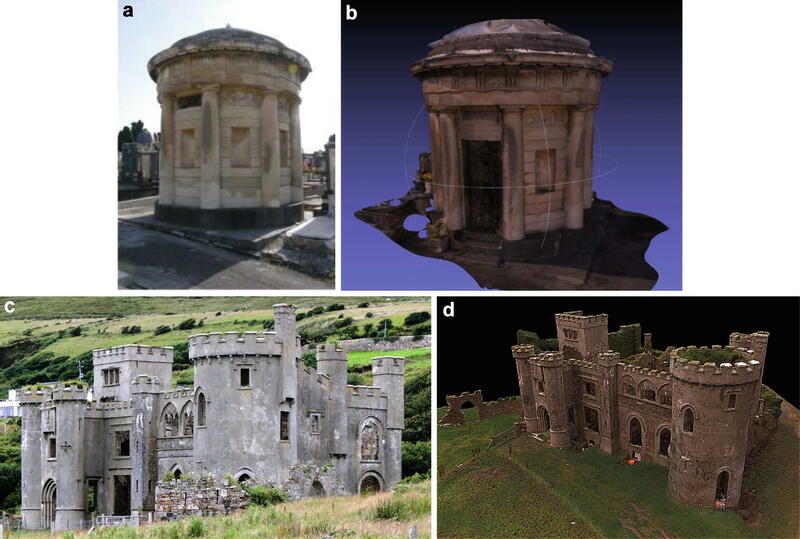 The 3D digitization process is tailored according to physical dimensions; thus, monuments and archaeological sites are digitized with the use of topographic techniques and aerial photogrammetry, whereas close-range photogrammetry is a better-suited, cost-effective 3D digitization solution for smaller-scale objects (Pavlidis et al. 2007). Several studies document best practices and demonstrate the advantages of employing either close-range or aerial photogrammetry for the 3D digitization of cultural heritage. Some of these advantages are high accuracy of the produced 3D models and improvement of the safety factor during the digitization of hazardous or inaccessible areas (Remondino et al. 2005; Yilmaz et al. 2007; Fassi et al. 2013). Santagati et al. 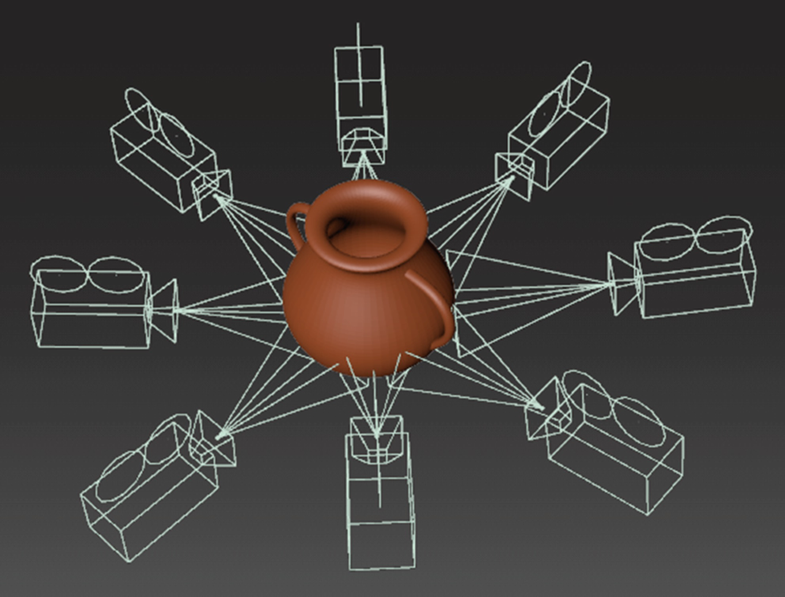 (2013) provide an example of close-range photogrammetry in cultural heritage documentation, describing the 3D digitization process of a small chapel using Autodesk 123D Catch (recently rebranded to Recap https://www.autodesk.com/products/recap/), a widespread, cloud-based, free photogrammetry software (see Fig. 2aand b). The study revealed that close-range photogrammetry requires short image processing times while offering high accuracy and quality even when nonprofessional cameras are used. Moreover, the metric accuracy for small objects (e.g., statures) is in the order of mm, while for medium to large objects and architectural buildings, it is in the order of cm. On the other hand, aerial photogrammetry can be used to accurately digitize monuments (Grussenmeyer et al. 2008). An example is shown in Fig. 2cand d, where a castle’s 3D model has been produced using photographs taken with a camera mounted on a drone, thereafter fed to a popular aerial photogrammetry software, Pix4Dmodel https://pix4d.com/product/pix4dmodel/. Even if photogrammetry appears suitable for 3D cultural heritage digitization, it does not come without limitations. The most common ones are the long processing times to attain high accuracy (Fassi et al. 2013), the requirement of software products for structured photo datasets (Santagati et al. 2013), and the holes found on 3D objects when the physical object is not properly photographed (Remondino et al. 2005). The 3D digitization of cultural heritage may be carried out through the manual creation of 3D models, by analyzing architectural plans, or via automated methods, such as laser scanning and photogrammetry. Even though there is an ongoing debate regarding comparative advantages of photogrammetry to laser scanning and vice versa, for 3D digitization in cultural heritage, complementary application of methods is considered as the most appropriate solution for digitization projects (Grussenmeyer et al. 2008).